Executive Chef François Blais of Panache Restaurant at Auberge Saint-Antoine in Québec, Canada shares his recipes for a lovely two-course menu for Mr. Leblond's Golden Beet and Granny Smith Apple Salad, and Hachis Parmentier - Hare from Québec, which reflects the restaurant's focus of "French Canadian cuisine with a twist." 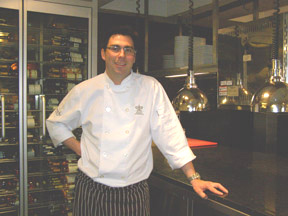 When I read about the Panache Restaurant philosophy of "French Canadian cuisine with a twist," I wanted to know more about the very talented Executive Chef François Blais and the award-winning restaurant, which opened in 2004. After having dinner at the restaurant in May 2009, I had a better understanding of what they meant by "with a twist," and meeting with Chef François Blais the following day provided me with a new insight into his approach which is traditional regional cuisine only with a lighter approach and beautifully presented. When a city is 400 years old (its anniversary was in 2008), it is wonderful to keep traditions, and gently change them a bit to make them interesting for now. The result is stunning; visually creative and appealing, and well executed to make the most of each delicious ingredient. For a chef, fresh products are the staples that make a kitchen sing, and for Chef François Blais, he has the added advantage that the hotel has its own farm on the Île d'Orléans where they grow vegetables and fruits. He enjoys going out there and "getting dirty" picking berries and the best produce to use in the restaurant, and also shops at the Vieux Marché located a short stroll from the restaurant where he buys from the local farmers, as well purchases lamb, beef, and duck from the producers, who also bring venison, caribou, and rabbit, when in season. He is a firm believer in buying locally and praised the cheeses from the region, with more than 280 cheeses made in Québec. When not in the kitchen trying out new recipes or experimenting with his two Pacojets, as well as looking at ways to take a "greener" approach at the restaurant, he likes to go bicycling and to ride everywhere. Executive Chef François Blais shares his recipes to provide a delectable taste of "French Canadian cuisine with a twist." Bon Appétit! The Vinaigrette Method: Extract the juice from the apples and parsnips with a juice extractor. Heat and reduce to half the original volume. Pour the apple and parsnip juice into a blender with the lemon juice, shallots, garlic, and the apple cider vinegar. Process and then slowly add the oil to create an emulsion, season with salt and pepper. * Note: this vinaigrette may be kept in the refrigerator for up to 2 weeks. Golden Beets Method: Wrap the golden beets with garlic and herbs in aluminum foil. Place the foil packet in a very hot oven at 375° F (190° C) for about 3 hours or until the beets are completely cooked. When cold, peel the beets and slice as thin as carpaccio. Presentation: Alternately layer the beets and Granny Smith apples. Sprinkle with chives, hazelnuts, salt, pepper, and the vinaigrette. Method: Braise the hare with the wine, stock, lard, garlic, mirepoix, and the bouquet garni for approximately 3 hours at 340° F (170° C). Filter the jus and season with salt and pepper to taste. The jus will be the sauce. Make a dry purée with the potato, celery root, salt and pepper. Sauté the leek in the butter until the leeks are slightly translucent. Add the rabbit meat and season to taste. Place the meat into four small oven-ready molds and place on shallow serving bowls or plates. Layer the meat with the puree and then add a small layer of goat cheese. Place under the broiler, and broil until the cheese is golden brown. Remove the molds and serve with the jus. Read about Panache Restaurant and the Auberge Saint-Antoine in the Hotels and Resorts and Restaurants sections and also in the Chefs' Recipes section where Executive Chef François Blais provides his delicious taste of the restaurant in French. Panache Restaurant is open for lunch Monday - Friday from 12:00 pm until 2:00 pm; and for dinner daily from 6:00 pm until 10:00 pm, with the exception of holidays. Read other articles on Québec in the Destinations, Hotels and Resorts, Restaurants, Chefs' Recipes, Spas, and Arts - Performances sections. 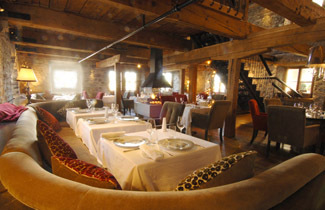 For more information on Québec, please visit the websites: www.QuebecRegion.com and www.bonjourQuebec.com. For information on traveling by train in Canada, please visit the Via Rail Canada website at: www.ViaRail.ca or contact them at: +1-888- 842-7245. For weather information in Canada, please visit the websites: www.Weather.EC.qc.ca and www.TheWeatherNetwork.com. © August 2009. Luxury Experience. www.LuxuryExperience.com All rights reserved.